~ Search results - 13 products found! ManageEngine ADManager Plus is a web-based Windows Active Directory management, reporting and delegation software. ADManager Plus offers comprehensive user and computer management solutions that include basic utilities like creating or deleting users and advanced features like bulk-importing users from a csv file. ADManager Plus also boasts of more than 150 different reports that cater to different IT management needs. This package of reports also includes out-of-the-box reports for compliance to various Government laws like SOX, HIPAA and GLBA. These reports can also be exported in different formats according to your requirement. Another feature that distinguishes ADManager Plus is its delegation capabilities. ADManager Plus''s non-invasive delegation model efficiently takes care care of delegating administrative tasks without elevating the user rights in the Active Directory. What''s more? The feature-loaded, reliable and easy-to-use software comes light on your wallets! ManageEngine OpManager is a combined Network, System and Application monitoring software. OpManager offers a live view of Routers, Switches, Servers, Firewalls, Wireless Access Points, UPSs & Printers using special maps which show the status of interfaces / ports and services. 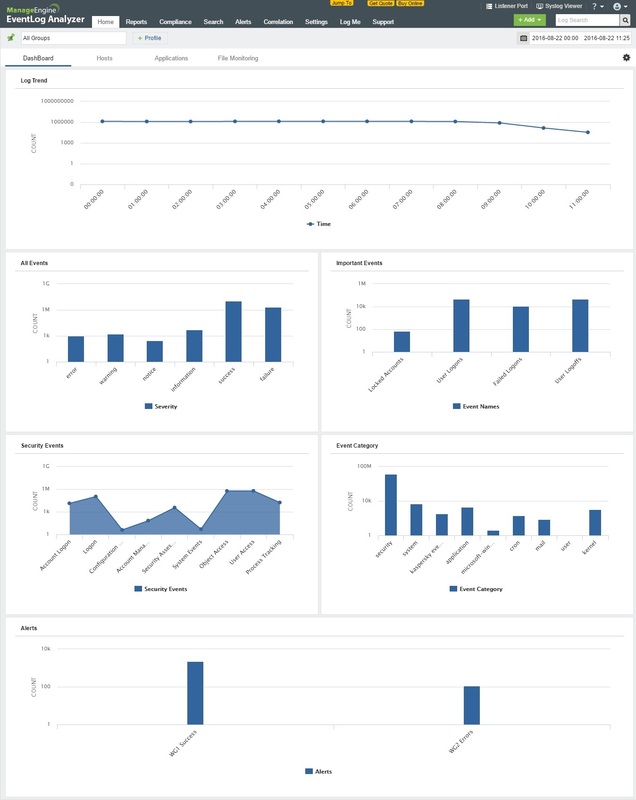 A rich set of graphs and reports for Interface utilization, CPU, memory and disk utilization are available out-of-the-box. OpManager enables multi-vendor network monitoring with out-of-the-box support for the most popular devices. With it’s fault management and performance management functionality, OpManager is an ideal network monitoring tool for managing today’s complex networks. The Small Network 20 Node Edition is available Free of cost. ManageEngine OpUtils is a Web-based IP Address Management software that helps to effectively manage your IP Addresses. With OpUtils you can 1)Automatically discover your subnets or import them from a CSV file, 2)Group subnets in a hierarchical tree format, 3)Periodically scan them to determine the current status of IP as used or available, 4)Get the details of switch port to which an IP is connected, 5)Integrate with Windows Active Directory to get the domain details of an IP, 6)Add custom columns to add user-defined data both at the subnet level and at the IP level, 7)View the history of IP allocations, 8)Audit and track the changes made to the IPAM tool, 9)View reports of your IP space. It addition to IP Address Management, you can also map your switch ports to devices, detect rogue devices, take a backup of your cisco configuration files, and much more. ManageEngine ServiceDesk Plus is web based Help Desk software with integrated Asset Management. 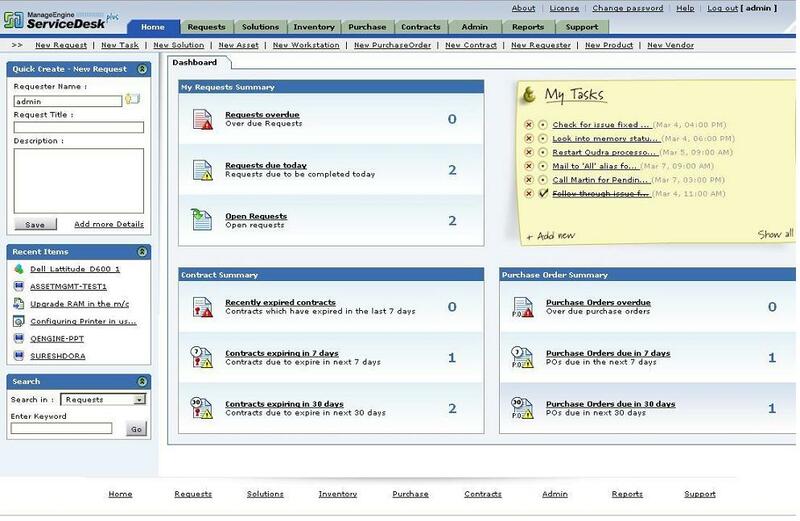 ServiceDesk Plus encompasses trouble ticketing, Knowledge Base, Self-Service Portal, Contracts Management, Purchase Order Management and comprehensive reporting in to a single easy to use package. ServiceDesk Plus gives you hassle free installation and affordable help desk, out of the box. It is used by more than 10,000 customers from different industry verticals all over the world to manage their Help Desk needs. ServiceDesk Plus also has an ITIL Ready edition encompassing all the best practices of ITIL. The main features include 1) Request Management with SLA, 2) Self-Service Portal, 3) Knowledge Base, 4) Asset Management, 5) Software Licensing Management, 6) Purchase Order Management, 7) Contracts Management, 8) Remote assistance, 9) Multi-Site Functionality 10) Out of the box and Custom Reporting and 11) ITIL Processes - Incident mgmt, Problem mgmt, Change mgmt & CMDB. 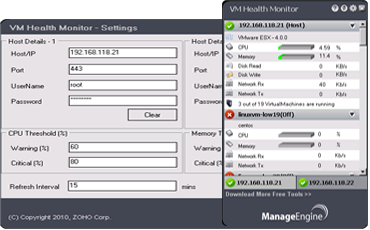 ManageEngine VM Health Monitor tool provides an exclusive ESX / ESXi monitoring, as a desktop tool dashboard. It shows the actual resource utilization of the virtual servers alongwith CPU and memory utilization for each guest OS on the ESX / ESXi server. The dashboard shows the count virtual machines present, the count of virtual machines powered on/off, resource utilization of CPU & memory by each VirtualMachine. ManageEngine MailArchiver Plus is a 24X7, real-time email archiving software for archiving emails from Exchange Server. It helps in email compliance by archiving emails from the Microsoft Exchange Journal and helps in complying with government regulations such as Sarbanes Oxley, HIPAA, etc. It can also archive Outlook PST files. Its search mechanism and reporting capabilities help in retrieving the necessary data for government investigators and regulators, resulting in lower cost on email discovery.